One of three Hopi villages on the Second Mesa, located on the southwestern side of the mesa. There are at least 57 known spellings for the name of this village, but the Hopi call it Shung-o-hu Pa Ovi ("Place by the spring where the Tall Reed Grow"). The Shongopovi village is often considered the most traditional or conservative of all the Hopi villages. The ruins of Old Shongopovi can be found on the hills below the current dwelling place and are considered the oldest Hopi settlement. 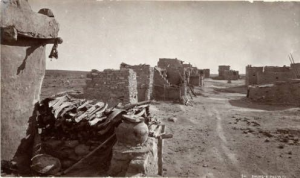 "Shungopovi Pueblo, Hopi, Arizona, 1875," photograph, (087583). Palace of the Governors Photo Archive, New Mexico History Museum, Santa Fe. Use with permission only.